Jim suggested Sunday that I should write a post about the fact that we’re staying in the area of my childhood home, and that got me to thinking more deeply. In fact, it brought me to thinking about how deep my roots are in this part of Tennessee. Thanks to my mom and other family members who have taken the time to research and document our family lines, I can tell you with great certainty that I come from a long line of pioneers, many of whom were some of the earliest settlers in southern Middle Tennessee. 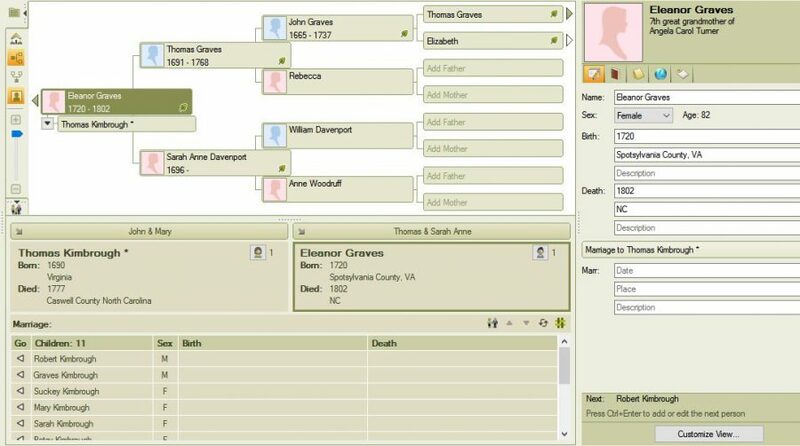 I’m a direct descendant of Captain Thomas Graves (my 12th great-grandfather) who came to America to bring supplies to Jamestown, Virginia, from England before he himself settled in the colonies. His great great-granddaughter Eleanor Graves (my 7th great-grandmother) married into the Kimbrough family, and it was her grandchildren who braved crossing into the Wilderness, leaving the more settled areas of Virginia and North Carolina to come to southern Middle Tennessee. Another line of my ancestors also came early to Tennessee. James Angus, Sr. (my 4th great-grandfather) was born and married in Amherst, Virginia, but his first child was born in Giles County, Tennessee, in 1806, less than 10 months after the marriage. He owned a large parcel of land, a very small part of which is still in our family, and I can visit his and other family member’s graves as I pass them each time I go to and from my Mom’s house. My 4th great-grandfather, James Angus, Sr. I could continue with information on other family lines, but I think you get the point. My family has been a part of this area of Tennessee for well over 200 years. My family roots go deep here, so being back in this area of Tennessee is not just that I am “home” in terms of where I grew up as a child and went to school, but I am home in that my pioneer ancestors fought and sacrificed to make a new life here over 200 years ago. 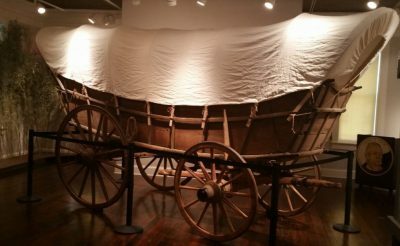 If you look at the picture below, what we call the original RV, it was in something like that wagon the men and women to whom I owe in great part my existence traversed the mountains and rivers to come to this beautiful land. Let me show you a bit of the land and the town in which I attended school in the pictures below. Childhood home hidden in trees – left; pines we planted – center, and a limb of the walnut tree on right. Southern Middle Tennesse is beautiful! The nearest town is Lynnville, and this is where Robert B. Jones High School (it was all grades 1 – 12) was located. Three generations of my family graduated from this school; I was in the last graduating class before consolidation took the place of community schools in Giles County. The school building I attended was torn down the summer after I graduated, but it was located on the top of the hill shown below. In the afternoons, while between classes and time to board the bus to go to ball games, I hung out at L. E. Moore’s Drug Store, housed in a building built in 1860 that survived the Civil War. Today, it is the home of Soda Pop Junction, but the soda fountain is the same as when I was a kid. What is today a day care was a dry cleaners, and the reddish-brown building below was the Co-Op when I was a child. It was the railroad that brought Lynnville to its current location. Originally, the town had been located about 4 miles west. It was also the railroad that, in part, brought Lynnville back to life after the school closed. In 1996, in celebration of Tennessee’s bicentennial, a train traveled the state with its cars filled with displays that pertained to the state’s history. It only stopped in about 20 locations, and Lynnville was one of those stops. Look carefully bottom left, and you will see it says L. E. Moore Drug Store. This was a dry cleaners when I was a kid. The Co-Op was here when I was growing up. The depot is now a museum. Robert B. Jones H. S. was on the top of this hill. The oak tree shown as the featured image has great meaning to me. First, I find this old oak tree to be the most beautiful tree I’ve ever seen; It is so strong and balanced. I’ve always thought it the most amazing tree, and travel has not changed my thinking. I don’t know how old it is, but my guess is between 250 and 300 years, so I romanticize that it may have given shelter and shade to many of my ancestors as they came into this part of Tennessee and perhaps off and on for years after. To stand strong for so long, it must have deep roots, but it also offers freedom to fly and explore to all the birds that might nest for a time in its strong, sheltering branches. The trunk of the oak tree in feature photo. I, too, have deep roots, but I think I also inherited the desire to fly – to explore – to wander – from my ancestors. Some have argued there is a genetic reason some of us are more prone to want to explore. Whether or not there is a genetic connection or not, it does seem that I have a similar wanderlust to that of several of my ancestors. While I enjoy visiting the new and unknown, not necessarily to begin life anew per se, I do have that adventurous spirit that spurs me to spread my figurative wings and fly out in search of new places and adventures. In a way, Jim and I have married our joint desire to travel and experience new things, places, people, customs, etc. with having the constant of “home” in our camper. 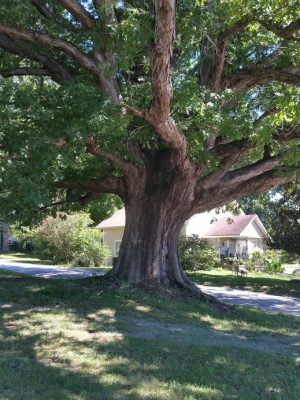 Still, in between adventures, my roots bring me home to Tennessee – an option modern times afford us that our ancestors did not have so readily. I am a lucky contradiction: I am deeply rooted while also a wandering spirit that soars to explore. To be so deeply rooted in a place is a wonderful blessing. Thank you for sharing this well-written and very personal piece! Hi Jennifer. We’ve been on the road the last couple of days, and today is the first time we’ve had our computers out and on the blog. I’ll have to look in Family Tree Maker to find the names you listed. With what you shared, it looks like you may more closely be related to my ex-husband. He and I found out 4 years after getting married that we are 5th cousins with James Angus, Sr. as our common ancestor. I’m so glad you shared this with me. I’m excited to check it out.